Digital Flex Media announces the introduction of a new long awaited alternative to DVD Replication with increased flexibility, damage resistance, environmentally friendly chemical composition and now can be mailed without requiring special handling. Flex-DVD Replication is the long awaited alternative to other media types and is designed with an environmentally friendly chemical composition as well as a unique shape that allows for more versatility in use. Digital Flex Media, a leader in DVD Replication, announces today an alternative to standard DVD replication and introduces a revolutionary Eco-Friendly Disc Alternative for the industry. Digital Flex Media patented replication solution; the Flex-DVD Replication is the long awaited alternative to other media types and is designed with an environmentally friendly chemical composition as well as a unique shape that allows for more versatility in use. The disc comes with standard storage capacity and playability, and is an ideal addition to magazines or direct mail campaign send outs. Because they are flexible and damage resistant, companies now can mail them without requiring special handling. Also, postage is stated to be 50% less than that for bulk mail outs of regular discs. The company is calling on publishers, and other companies who utilize disc replication in their marketing, training, or operational initiatives to contact the company immediately to begin the process of getting their projects completed. Present times have made mandatory an increased awareness about how business operations can impact the environment, which has been proposed to have a strong link to the improvement of the current economic situation that has hurt the ability of many companies to effectively market or operate on a reduced budget. Digital Flex Media is introducing a solution that helps customers save on important media replication projects, while doing their part for the environment. 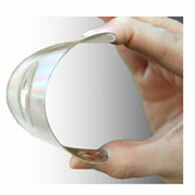 Digital Flex Media invested a huge amount of time, energy, and money into the research and development process. In the meantime, various optical disc replication facilities have “jumped on the bandwagon,” offering a similar product and service as it became clear that the Flex DVD was a viable and supremely profitable disc format. However, while other facilities are currently attempting to emulate the Digital Flex Media Flex DVD host of products, none of these “imitations” have come close to mirroring the same viability with regards to the engineering of the disc. Digital Flex Media is a licensed CD/DVD Replication company that provides nationwide replication, Fulfillment and packaging services to clients. The California-based company, founded on one principal and one goal is to provide best service and take pride in exceeding the expectations of every customer with more than a decade of experience providing services in various disc formats for clients in virtually every industry. Digital Flex Media is encouraging those in need of quality, affordable, media solutions to visit them today at http://www.DigitalFlexMedia.com for information on how their services match the important requirements of today fast paced business environment. In House Glass Mastering and Anti-Piracy and Anti-Rip and Copy Protection. Complete line of packaging sources.